Prometheus (review) isn't due on home video in a few more weeks (you can pre-order your copy righ here) but that's not stopping the marketing machine from continuing to churn and just when you thought it was safe to take a break from examining and discussing the movie, something new emerges. Today that something is a short clip featuring Captain Janek (Idris Elba) being fitted for a space suit. There's not much more than that but the under 60 second clip is preceded by nearly 30 seconds of static and non-descript images which are bound to get the internet abuzz once again. Is there really something hiding in the white noise? If there is I'm sure someone will figure it out. Watching this only reminds me of how underused Elba is in the movie. What discussion of the movie? There is no discussion, the movie was total crap. I loved that movie great dark scifi! Look forward to buying the Bluray! I watched the Coma remake on A&E, which Ridley Scott was a producer on, and I was shocked at how bad it was, as I was shocked at how bad Prometheus was. Lately it seems his projects, like most of Hollywood's, suffer from diretors or producers doing nothing to overcome terrible script writing. I find myself watching more and more independent and foreign films, as they are the only ones that seem to be intelligently written and executed. I though the second episode was a vast improvement on the first. I've still to see the last 2 but have PVRd them. Curious to see how the story plays out. I watched Coma, and was likewise completely shocked at its stunning awfulness. The script was almost a parody of the conference writing style, the cinematography nonsensical - and a great cast, wasted. 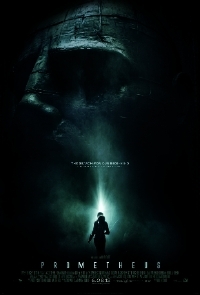 Prometheus, seen at London Waterloo IMax - the most stunning, intriguing, chaotic, jaw-dropping pleasure of a film. I sat with 3 friends, all of us thrilled, constantly surprised and giggling in delight. It isn't meant to be a French existential drama - however; it created a dazzlingly array of questions and a wonderful puzzle for those in the audience interested in having something intellectual substance to chew over (for days in our case). Can't wait for the extra material in the DVD release and hope that the follow up movies follow soon! Boo hoo, that guy lit a cigar and raised a Christmas tree as his first priorities after coming out of cryostasis! Hells yes! I would do the same. Plot holes my be damned. No one could have ever made the movie that expectations held for this movie. No one. Was Prometheus perfect? No. Was it his worst movie? No. Was it his best? No. Talk about it all you want, but I just think the apoplectic hyperbole over how bad it was is worse than the the movie ever will be. The title of this movie is proving to be more ironic than you could ever imagine, considering the reactions and repercussions. If you don't think that was his worst movie, please tell me which one is, because looking through the 31 films he's made (not including TV episodes which I have skipped, and 1 or 2 shorts) I have seen most, if not all of them. Even things like Robin Hood, which was a "flop" financially, was better than this tripe. Why? Because the characters didn't act like complete morons like they did in Prometheus. Nor were there plots holes and "WTF" moments you could drive the Nostromo through. I'm not going to get into a derivative argument about which movie is better than the other for personal preferences. I think Scott is a great "Film Maker". I don't disagree that there were issues. I don't expect perfect, because there is no perfect. As for the "characters acting like complete morons", you would be surprised what people will do when faced with obvious dangers and how hysterical blindness and denial will allow people to easily enter into the Darwin awards. In other words, people do really dumb things all the time when playing with fire. Maybe the goal was to send all the dumb people into space? Kind of like a enema or a toxic cleanse. Now this makes more sense. Not a band stand alone movie. Kind of disliked all the DUMB people managing to travel through space. "Oh look.. a snake like ALIEN creature... I wonder if it will be friends with m.... URKKK AARGGHHHH"
As @Dingusamongus mentions, you'd be surprised.. I happened to watch a documentary on, Air_France_Flight_447, last night. 3 intelligent, highly trained pilots, none can figure out the problem and in any event, one of them is inexplicably pulling back on the stick from 48thousand feet to the sea - terrifying and astonishing, yet this sort of panicked response is all to common. I have to say, I think I know a few people who'd, "Oh look.." and a few who'd run around mindlessly rather than coolcalmcollectedness. The WTF moments were jems, the holes - yeh, but they weren't so dreadful, I guess this HardSciFiLite fair and that's fair enough? @Cohaagen and @Digger, well, we found watching the obligatory 'dear God, please don't go down that dark alley/cellar etc' moments kinda fun!!? Christ on a bike!! The crew of a spaceship is expected to quite professional. They are all supposed to be scientists or whatever in this film and they act like complete idiots, touching everything and moving like a bunch fearless monkeys in front of what is supposed to be the biggest discover in human history.That absolutely ruins the film for me. Maybe Prometheus is supposed to be a comedy...hmmm...now I'll have to go re-watch it in that frame of mind, might improve things.